The concept of life insurance at divorce is that a supporting spouse (i.e. someone who is or should be working and is not retired, and who has an obligation to pay alimony to the spouse and child support for the benefit of any children) must secure those obligations. The concept of requiring supporting divorced parents and ex-husbands to maintain a fair and reasonable amount of life insurance arose in response to the fact that some of the people who get divorced will not survive until their obligations to pay child support and alimony have been fully satisfied. Because other people are dependant upon these people, there needed to be some security system in place. And so, the concept of life insurance to secure both alimony and child support developed over the years; such that it is required now for alimony any time there is a marriage of any substantial duration, or even in a short relationship with a couple who has a child. There will almost always be a life insurance provision in the ultimate Court Order. 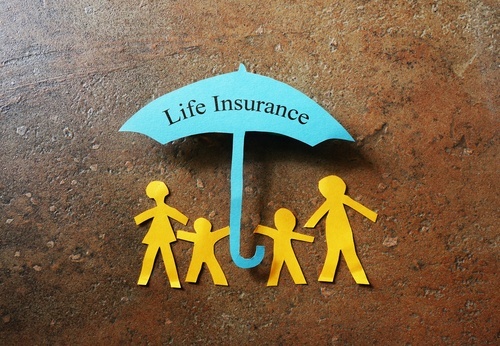 What is a fair amount of life insurance? That depends upon the facts of the particular case. First, regarding life insurance to fund an alimony obligation, what the supporting person usually will not agree to is a bonus payout to the other person, and what the supported person usually won't agree to is anything less than what she should have gotten had alimony been paid from the day of divorce until the day it is supposed to end. Similarly, regarding life insurance designed to replace child support, there usually needs to be enough money available to make sure that if something happens to the parent, that there is enough money available to make the child whole just as if child support was coming. From the payor's perspective, he is often on a tight budget as a result of the divorce and so he often is not going to be willing to pay for life insurance premiums that will provide any more life insurance than he would have paid in child support. If a guy has an obligation to pay alimony of $4,000.00 a month times 12 months, that's $48,000.00 a year. If he's got that obligation for ten years that's a total of $480,000.00. So someone might say, "well, if he's gonna pay me $480,000.00 between now and ten years from now, and if we sign this thing today and he gets hit bit a bus tomorrow and dies, I need to know that he's got a $480,000.00 life insurance policy sitting there so that I'm made whole." But the other side responds, "That's not true." They say that it's not true because if he signs this document today and dies today, the ex-wife is not entitled to $480,000.00 to make her whole. -taxable to the recipient, whereas alimony is taxable to the recipient (at least it is as of Nov. 11, 2017, the day that this article is being prepared), a lesser amount of life insurance is required to make a dependant former spouse whole in the event of the premature death of the supporting spouse. So if he gets hit by a truck and dies today then the $480,000.00 that he would've paid you over the next ten years isn't going to come from alimony. How much money do we need? Well probably $400,000.00, maybe $380,000.00. Something like that. We have to figure out what your tax rate is likely to be but probably somewhere around $375,000.00 to $400,000.00 is the amount of life insurance that we need to protect the wife over the next ten years. By way of second example, this time involving child support, note that child support is different because unlike alimony, child support is not deductable to the payor. Thus a dollar for dollar amount of life insurance will normally be necessary. Let's assume that child support is $400.00 a week. $400.00 a week times 52 weeks a year is going to be roughly $21,000.00 a year times the number of years between now and the time the child is likely to be 22 years old and out of college. We also need his share of the college related costs so we'd have to build that in. If college costs are $40,000.00 a year, we would need an extra $160,000 in life insurance coverage. So in this example, we would need $21,000 for each year between now and the time the child graduates college at age 22. We would need an additional $160,000 to fund college. There would be no reduction in the amount necessary to fully fund the obligations as there would be for alimony for the tax reasons discussed above. Third example: Does NJ Divorce Law require a retired man with grown, emancipated children to continue to provide life insurance for his ex-wife's benefit at his cost after they divorce? Well, in the first draft of this article I answered my own question with an emphatic "No!" Because if there is no alimony obligation (because he is retired) and if there is no child support obligation (because all of the children have been "emancipated") then there is no underlying obligation that requires "funding" with life insurance. However, upon further reflection, if we have a case with two retired senior citizens who have, as part of their marital standard of living, chosen to maintain life insurance well beyond the time of retirement, then that raises an interesting question about whether the wife can insist that the husband pay to continue that life insurance for her benefit after a divorce as part of her status quo.